Slidell, LA – November 12, 2018 – Organizers of the largest tiny house festivals in the US are bringing their for-charity festival to Louisiana to benefit the Louisiana Cultural Economy Foundation. New Orleans, LA – November 12, 2018 – The Louisiana Cultural Economy Foundation and partner United Tiny House Association will present a screening of two films about the tiny house movement, along with the HGTV unveiling of Tiny Firehouse in Duncan Plaza, across from City Hall off of Gravier Street. Tiny Traveling Theatre will be on-hand to transition from tiny house on wheels to movie theatre to screen. Tiny House Expedition’s Living Tiny Legally Part 1, Alex Eaves’s Reuse! Because You Can’t Recycle the Planet, and John and Fin Kernohan’s episode of HGTV’s Tiny House Big Living where they unveil the Tiny Firehouse. Sponsored by Capital One and Cox Communications, the Louisiana Tiny House Festival will take place Friday, December 7 through Sunday, December 9 at Heritage Park in Olde Towne Slidell. Tiny houses, vintage campers, tear drops, school bus conversions, gypsy wagons and other styles of tiny structures will be available to view and tour. The Bucktown Allstars will headline the event, with other Louisiana-based music and performance art from Ray of Light. For a $15 advance admission ticket, festival-goers will tour tiny houses and hear from tiny house celebrities and nationally- recognized leaders from the tiny house community. Friday is FREE admission for school groups from 9 a.m.-noon and free for everyone 5 to 8 p.m. Saturday and Sunday will feature live music, workshops, a Children’s Village with activities sponsored by Slidell Memorial Hospital and Ochsner Health System, a Holiday Art Market and more. Plus, retired, active and discharged military, law enforcement, and firefighters have FREE admission all weekend. 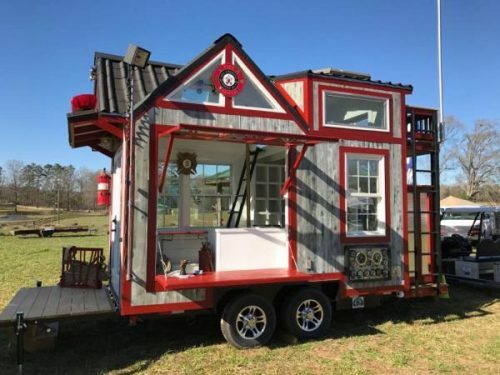 Some of the confirmed tiny houses include Tiny Traveling Theatre, Gypsy Wagon, Re-Use Box Truck and Tiny Firehouse. Be enlightened, motivated, and enriched, as some of the most recognized women of the tiny house movement, who have built and/or are living in their tiny homes, share their experiences, trials/tribulations, successes, and lessons they have learned during their tiny journeys. John & Fin Kernohan – Tiny Fire House Station No. 9, Beloved Cabin tiny house, founders & chairpersons of the United Tiny House Association, Founders & co-organizers of the Georgia Tiny House Festival, owners of Tiny House Rescuers, featured on “Tiny House Big Living,” living 6+ years full-time in their off-grid 304 sq. ft Beloved Cabin, DIY experts, and public speakers. Alex Eaves, who lives full time in his converted box truck, is a recycling expert, tiny living advocate, sustainability sensei (our word), walks the walk of minimalism, film director of REUSE: Because You Can’t Recycle the Planet, owner of STAY VOCAL and Reuse. The Louisiana Tiny House Festival is a collaboration between New Orleans and Lafayette-based non-profit Louisiana Cultural Economy Foundation and the United Tiny House Association; and is another of the United Tiny House Association’s for-charity events, which will raise funds to support the Louisiana Cultural Economy Foundation’s programs for artists and creatives. The United Tiny House Association has funded the building of tiny houses for families in need from the proceeds of its for-charity Tiny House Festivals, endowed the annual Tiny House Scholarship Fund, and has raised funds for 60+ non-profits, charitable organizations and great causes. The Louisiana Cultural Economy Foundation was established as a 501(c)3 organization in 2005 and serves as a catalyst for the development and enhancement of the distinct cultural industries of Louisiana by promoting the economic health and quality of life of our cultural economy workforce. This includes the Catapult Fund, Louisiana Culturepreneur Fund, Musicians for a Smoke-Free Louisiana and the Culture-Up incubator in Downtown New Orleans.